For automobile drivers it’s tires, for runners it’s shoes. The runner’s only point of contact with the ground. Shoes are responsible for guiding movement, damping shock, and supporting sound ergonomics. If the shoe fails in this task, pain and injuries result. So good advice is an essential sales criterion when a runner selects new shoes. But can running shoes be bought on the Internet without this advice? Indeed they can. RUN1ST shows how it works. The goal of the RUN1ST retailer portal is to bundle the experience of over 50 participating running shoe stores on a single website. 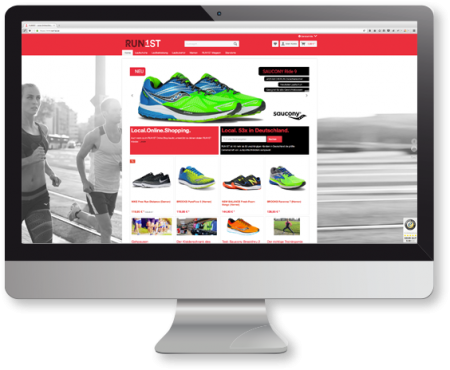 RUN1ST is not merely a sales portal – all the shoes that are offered are tested and reviewed by experienced runners. Videos containing advice on the given model are often available for viewing. Detailed product information is provided on each shoe, as well as customer evaluations, tables for shock absorption, maximum bodyweight, pronation, and other key decision-making criteria for the runner. Many of the retailers contribute their own know-how, making the portal both a shopping platform and an information platform. What do the local retailers gain from RUN1ST? RUN1ST is a centralized webshop for all retailers participating in the exchange. So it is not necessary for each of the 50 retailers to operate its own webshop in order to be visible in the Internet. Everything goes through one single website. Marketing, Web design, order development, payment – everything is administered centrally and only generates costs a single time. Thanks to a sophisticated order management system, the retailer can concentrate on its core business – selling in the store and providing advice – but still participate in sales generated by the webshop. In the case of RUN1ST, the Shopware system is used, and retailer integration is handled by gaxsys GmbH from Karlsruhe. The gax-System makes it possible to pass customer orders received in the RUN1ST webshop on to participating local retailers. The technical solution is to have a product exchange that provides access to all of the participating retailers. When an order is received, it appears on the exchange. Any retailer who has the ordered merchandise in stock can accept and fulfil the order. The local retailer works with partners like New Balance, Brooks, adidas and asics and enjoys the best possible Internet presence. All of the marketing work and expense and the operation of the online shop are handled by the central virtual contact point RUN1ST. Distribution and management of the individual webshop orders, and the output of shipping and return documents are handled by the gax-System. In addition, gaxsys also provides invoicing documents that meet generally accepted accounting requirements for all of the participants. “As a community, we establish a visibility that the individual retailer cannot generate – the cost of advertising, search engine placement optimization, social media and content marketing would simply be too large,” states Christian Dohm, founder of the RUN1ST alliance. RUN1ST wants to take over precisely these tasks but work with the retailers as partners and help them establish a presence in the digital world. “In this way the retailer can also offer the merchandise that it has in stock online without having to create its own online shop. RUN1ST also handles the hard work of administering and updating the content of the Web presence. So traditional and modern distribution channels are finally combined in a retailer-friendly manner. In practice, consumers visit the RUN1ST website, order their merchandise there, and then receive the merchandise from a local retailer. The dealer’s location relative to the customer is taken into account. In other words, the order is offered first to those dealers who are in the consumer’s immediate vicinity. Then the search radius is gradually expanded. The first authorized retailer who has the desired merchandise in stock accepts the order and delivers the merchandise. The gax system also allows consumers to pick up their merchandise directly at the store via Click and Collect. When customers utilize this feature, additional sales can be generated at the local store. So a virtual shopping trip can also lead to a strong and vital shopping culture at the local level. Using the system, it is also possible to achieve Same-Day Delivery economically.